Architectural door control in a dull silver finish. 2 valve adjustment to incorporate closing and latch speeds with universal application. 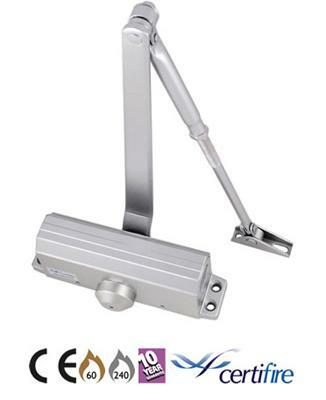 Non-handed for standard, top jamb, parallel or corner bracket installation. (Parallel arm bracket is included). Buying this product will earn 140 Loyalty Points. Be the first to submit a review for the Eclipse Overhead Door Closer (28730).